Schedules and other facts for the 187th Annual General Conference of The Church of Jesus Christ of Latter-day Saints, which will be held in the Conference Center in Salt Lake City. The Saturday, April 1, general sessions will be held at 10 a.m. and 2 p.m. MDT. Sunday, April 2, sessions will be held at 9:30 a.m. (which includes “Music and the Spoken Word“) and 2 p.m. The general women’s session was held Saturday, March 25, at 6 p.m. MDT, and the general priesthood session will be held Saturday, April 1, at 6 p.m.
General conference is broadcast via satellite to church meetinghouses throughout the world, and it is available through television, radio, the internet and other media. Go to bonneville.info, and click “Continue” under the General Conference section for a complete list of TV, radio or satellite reception options for all 50 states, plus Canada and Bermuda. 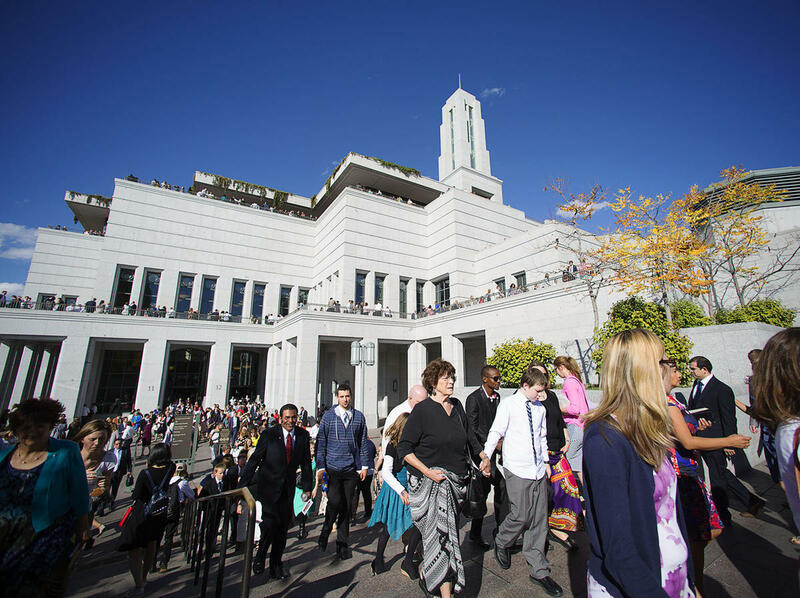 On Salt Lake-area TV: All four general sessions will be broadcast live on KSL/Ch. 5 and on cable/satellite channel BYUtv. The women’s session and priesthood session will also be broadcast on BYUtv. KBYU/Channel 11 will repeat the morning sessions at noon and the afternoon sessions at 4 p.m. both days. On the radio: All four general sessions will air on KSL Radio (AM-1160/FM-102.7), KBYU (FM-89.1) and BYU-Radio (Sirius XM-143). BYU-Radio also aired the general women’s session and will air the general priesthood session. Visit bonneville.info to find stations outside Utah and the Salt Lake area that will air conference. On satellite and other TV stations: The church will provide an analog signal and digital signal for broadcasters and home satellite dish owners. Click here for more information. Check local program listings for other cable or TV availability in your area, or visit bonneville.info, byutv.org or ksl.com for more information. On the Web: A live broadcast will be available on deseretnews.com, lds.org, YouTube, BYUtv and BYUtv International, as well as through the Mormon Channel (YouTube, apps, website and Roku). A summary of each talk will be posted to deseretnews.com throughout the weekend. Social media: Follow @LDSConf on Twitter for live updates during all sessions. Use #LDSConf in your tweets to share your thoughts with others who are watching and tweeting. For a full list of the recommended hashtags, click here. Post-conference downloads: Audio and video files of the session are available within one to seven days after the conference ends. Text files of the talks are available within two to 20 days after general conference. Click here for more information. To read more about ways you can participate in General Conference, click here.